HanneysCorns is a future 'retirement' project for my husband, Jeff and I. We have had an interest in reptiles for a few years, but we both have been 'mesmerized' by the beauty of cornsnakes and we found ourselves acquiring quite a few. Our venture into 'hobby breeding' was a natural as our snakes matured. Genetics has always been a favorite subject of mine and with my husband's encouragement and help, my breeding projects are now a reality. Of course, in any project, there is always overflow, and we couldn't possible keep all our many hatchlings...thus this site was created and HanneysCorns has officially launched. Our joint efforts at HanneysCorns can be easily defined. 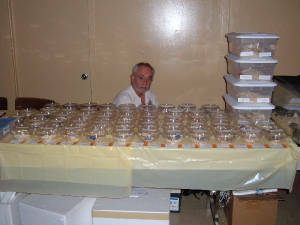 Jeff does the feeding and cleaning of tanks, and I am responsible for record keeping, egg and hatchling care, correspondence, and planning the breeding projects. We have grown to love the hobby not only as 'corn admirers' but for the 'stress relief' it adds to our normally hectic lives. We have attended many reptile shows in Southern Ontario over the last few years as buyers, and in September of 2005 we were vendors for the first time at the Reptile Expo in Mississauga, Ontario. What a wonderful experiene. Many say I am passionate about my corns, but a day spent at a reptile expo is a highlight for me. Time certainly flies when you are having fun and a day of 'talking corns' to everyone who drops by our table keeps the adrenalin constantly flowing. When corns first entered our life and we found ourselves caught up in the 'addiction', I began to explore and research where I could find such beauties as 'lavenders', 'butters', and 'pewters' to add to our collection. I was very disappointed to discover that most large breeders who had a variety of these 'high-end' morphs were located in the U.S. and shipping costs to Canada were so steep as to make any transaction seem almost impossible to afford. 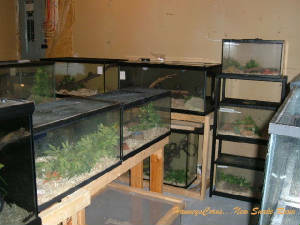 I was about to discover, close to home, a fellow cornsnake enthusiast, and well known Canadian breeder, Simon Fung. He graciously invited Jeff and I to London; he had a 'butter male' for sale and this was definitely on my list of 'wants' at the time. We spent many hours chatting with Simon and gracious as he was, he took the time to share his knowledge of corn genetics. Building our dream into "HanneysCorns" has evolved not only into a passion for the beauty of cornsnakes in both colour and pattern, but also into corn genetics and the future of the hobby here in Canada. The many hatchlings from our projects cannot all find homes here and many are available for those who are interested in their genetics or for pets. Some will be used for other's projects and we hope to work closely with them. Co-operation and sharing knowledge will only advance this hobby to new heights and many, many more beautiful morphs to behold. When time permits and stock is available we like to socialize with other corn enthusiasts at the many Reptile Expos open for the public. Look for us at your nearest reptile show. Stop by and visit our table. Ask questions. We are addicted to corns and never grow tired of 'corntalk'.